American Legion Post 14 - American Legion Oratorical Contest﻿ The American Legion Oratorical Contest exists to develop deeper knowledge and appreciation for the U.S. Constitution among high school students. Since 1938, the program has presented participants with an academic speaking challenge that teaches important leadership qualities, the history of our nation’s laws, the ability to think and speak clearly, and an understanding of the duties, responsibilities, rights and privileges of American citizenship﻿﻿. 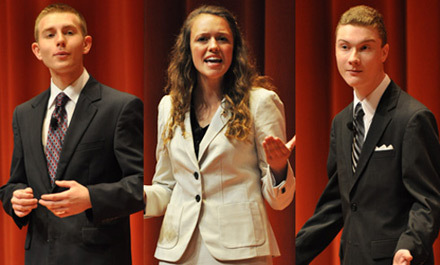 The American Legion Oratorical Contest exists to develop deeper knowledge and appreciation for the U.S. Constitution among high school students. Since 1938, the program has presented participants with an academic speaking challenge that teaches important leadership qualities, the history of our nation’s laws, the ability to think and speak clearly, and an understanding of the duties, responsibilities, rights and privileges of American citizenship﻿﻿.